Born about 1890, son of William and Elizabeth A. Lowe of 38, New Westwood. William had brothers Christopher, Samuel and Harry and sisters Emma and Florence. His father, William, is listed on the 1911 Census as a bricklayer, and was responsible for building a number of houses at New Westwood, later selling them to take up residence as publican at The Corner Pin, Old Westwood, (Palmerston Street). The family later moved to the Shepherd’s Rest Public House, Bagthorpe, Notts. William enlisted at Hucknall, date unknown but the medals he was awarded indicate that he did not reach France until after 1915. He was a recipient of the British War and Victory Medals. 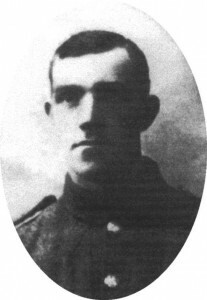 William Lowe was killed in action on Friday 23rd June 1916, in the trenches near Givenchy, France, aged about 26 years. His family received a letter from the Reverend G. P. Daniels, Chaplain attached to the 16th Sherwood Foresters, dated 25th July 1916. The letter confirmed that the Red Cross Society would take a photograph of William’s grave and forward it to them. 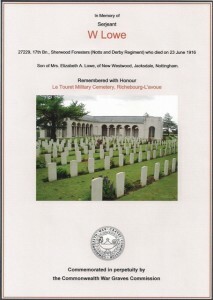 William is buried at Le Touret Military Cemetery, Pas de Calais, France. The cemetery was used throughout the war and there are over 900 casualties buried there. 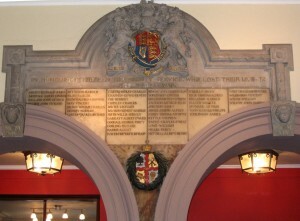 Recent information suggests that William is commemorated on the roll of honour at the Shire Hall Nottingham. It is now believed that he may have been a police officer before joining up, although the Census indicates that, in 1911, William was a coal miner ganger.